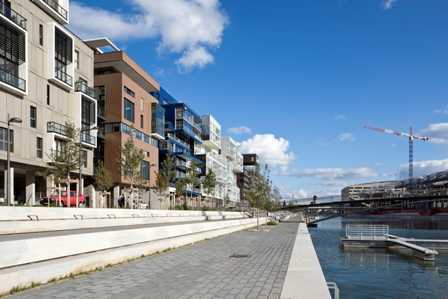 In the south of the Presqu’île, at the confluence of the rivers Rhone and Saône, the renovation of the Lyon Confluence district is one of the largest urban planning projects in Europe and it is set to double the size of Lyon’s city center. This area, which used to host numerous industrial and port-related activities, has been undergoing a profound transformation for several years. With the Place Nautique and its terraces, a 2-kilometre promenade along the Saône river, housing, businesses (include the large Lyon-Confluence shopping center) cultural and leisure activities, and major companies and institutions (GL Events, Euronews, Le Progrès, Michelin star chef Nicolas le Bec, Cardinal, Eiffage, GDF-Suez and the Rhône-Alpes Regional Council building), Lyon Confluence will become a prestigious new district of Lyon. Served by the A7 motorway and Perrache TGV station, Lyon Confluence is also linked to a metro and tram line, which is set to be extended by 2014 to the scientific district of Lyon Gerland, passing by the future Confluence Museum. This site also offers an amazing natural environment with over 5 kilometers of quays. Lyon Confluence will be a showcase for urban innovation in Lyon for the coming years. More information about urban projects in Lyon, contact us !